Help Jo in making her dream come true! Join this young girl in a challenging journey of building her very own Coffee Shop! Learn with Jo how to make all different kinds of coffee, take orders, serve drinks and manage staff. Make customers happy by serving them fast with correct orders, improve their mood by inviting musicians and attracting celebrities. Grow Jo's Coffee Shop from a two tabled cafe to a big fabulous looking restaurant in this fun time management game. Enjoy lots of levels, amazing graphics, and addicting gameplay. 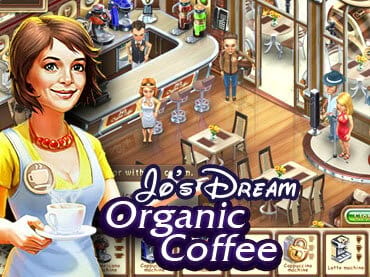 If you have questions about Jo's Dream: Organic Coffee game, please contact us using this form.